The bedroom of Philippe Lesbahy, wife of Gilles Berthelot, has been reconstructed according to the procedures known in France during the Renaissance. Overall view of the "Renaissance bedroom". In spite of the rearrangements the castle has undergone since it was built, the first floor retains the original distribution. The reconstruction of the bedroom of Philippe Lesbahy is based on significant work with regard to archival and iconographic studies for reproducing the bed textiles. This restoration enabled regaining the skills of rush weaving, the matting of which adorns the walls. In the early 16th century, the bedroom was not just a place to rest but a real living space, where one receives, eats and works. The furniture installed here is a reflection of these multiple functions. During the Renaissance, the château walls were covered with tapestries or rush matting, which insulated the rooms from the cold. Although no example of rush matting has been preserved in France, documents (inventories, drawings, tables) testify to this insulation method, to which therapeutic virtues are also attributed Indeed, the smell of the reeds was supposed to expel bad moods and cleanse the air. Central element of the room, the bed is placed on a platform. Thus elevated, it is protected from the cold ground in floor-tiles. Detail of the bed of the "Renaissance" bedroom. The bed shown here does not date from the Renaissance – 16th-century furniture is extremely rare – but from the 19th century. It illustrates the neo-renaissance style in vogue around 1840 and to which the Biencourt, owners of the castle at that time, were enamoured. The lining of the bed is modern: it was made from a scientific study based on a comparison of paintings from the second half of the 16th century. 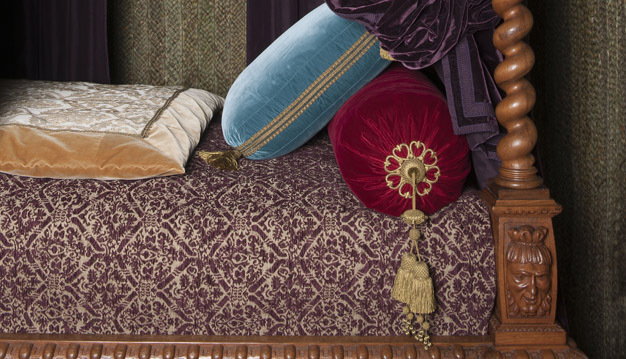 Purple damask, silk velvet trimmings and precious embroideries illustrate the richness and shimmer of Renaissance beds, a true representation of pomp and prestige of their owner. During the Renaissance, a trunk was a key element of furniture. Easily transportable, it was suited to the lifestyle of the aristocracy, which still moved around from residence to château. The trunk shown here dates from the 19th century: like the bed, it was designed in a neo-Renaissance style in vogue at the time where the Biencourt family lived in the château.